Conference Presentations — Presentations from #ESUG16 Now Available! Customers and partners can request media or an ftp transfer of Cincom ObjectStudio and Cincom VisualWorks. For other options, please speak with your account manager, or contact the Cincom Smalltalk Product Team. To request this release, please fill out the short form on this page. In an awards ceremony that was held on October 18, 2016 in Brussels, Belgium, Cincom Smalltalk partner, MediaGeniX, won the Prijs van de Vlaamse Regering voor de Beloftevolle Onderneming van het Jaar Award, which recognizes promising Flemish companies. Click here for more information. Presentations from #ESUG16 Now Available! The 2016 European Smalltalk User Group Conference, which was held in Prague, Czechia on August 22 through 26, has come and gone, but you can still see the insightful and informative presentations. Click here to see the presentations that are available. The Fundación Argentina de Smalltalk (FAST) invites you to the 10th International Conference on Smalltalk Technologies (Smalltalks), which will be held on November 9-11 at the Universidad Tecnológica Nacional, Facultad Regional Tucumán, in the city of Tucumán, Argentina. Please make sure to register early to receive the conference shirt and to help plan the conference’s social events. Donations from participants are also being accepted for the purpose of helping to fund the conference costs. Click here for additional information. Since the Zürich Smalltalkers had so much fun the last few times they’ve gotten together, they have decided that it would be a shame to miss an opportunity to reconvene! The group will meet at 7:00 p.m. on November 8. Click here for more information about this meeting. Adventure World German Language, a museum-quality exhibit that showcases the extensive history of the German language, went through a significant expansion in 2015, with all of the programming being done using Cincom VisualWorks. After it was decided that a good exhibit could be made even better, Cincom VisualWorks once again is the tool of choice. Click here for more information. JSON data type support has been popular in the last few years since it provides greater flexibility for users. In this article, we will demonstrate how to use ODBCEXDI to handle JSON data in VisualWorks. Click here for the article. The purpose of the Hidden Gems Screencast is to make developers who use Cincom Smalltalk aware of the useful abilities of the products that may not be obvious. This month’s edition is on SearchLight. A Cincom Smalltalk customer recently asked a very pertinent question regarding the migration from Visual Wave in Cincom VisualWorks 7. * to VisualWorks 8.1, and members of our Cincom Smalltalk engineering team were more than happy to provide a detailed response. Click here for this Q&A. For information on the System Browser Overview tutorial, click here. For information on the Core Browser Usage tutorial, click here. For information on the Inspector Tool tutorial, click here. For information on the Debugger Overview tutorial, click here. For information on the Debugger Usage tutorial, click here. For information on the Version Control tutorial, click here. For information on the Process Monitor tutorial, click here. For information on the Code Recovery tutorial, click here. For information on the Cincom ObjectStudio Product Introduction tutorial, click here. For information on the Cincom VisualWorks Product Launcher tutorial, click here. For information on the Cincom ObjectStudio GUI Designer, Part One tutorial, click here. 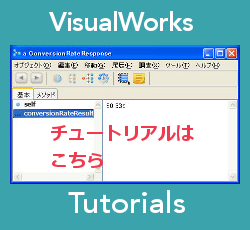 For information on the Cincom VisualWorks Product Introduction tutorial, click here. For information on the Cincom ObjectStudio GUI Designer, Part Two tutorial, click here. For information on the Cincom ObjectStudio Modeling Tool Overview tutorial, click here. For information on the Setting Up Your Environment tutorial, click here.